The transfer switch monitors utility power and signals the generator to start when utility power is interrupted. When utility power returns, the transfer switch returns the electrical load from the generator back to the utility. This ensures your most important electrical loads are powered, within seconds, even when you’re away. All RTS transfer switches are housed in a NEMA/UL Type 3R enclosure, with electrostatically applied and baked powder paint. The Heavy Duty Generac Contactor is a UL recognized device, designed for years of service. The control at the generator handles all the timing, sensing and exercising functions. 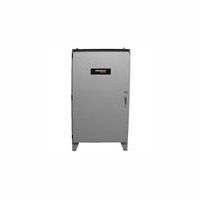 Designed to operate with the digital Nexus controller used on liquid-cooled QT series gaseous generators from 22- 150 kW.